Pineapples are delicious tropical fruit. Pineapple is rich source of fibers, manganese, vitamin C and vitamins of the B group. It can be consumed raw, in the form of juices, or as a part of various sweet and salty dishes. Pina colada is popular drink that is made of pineapples. There are more than a hundred varieties of pineapples that grow in varying sizes. Pineapple is used to alleviate symptoms of common cold, cough and nasal congestion (by decreasing the amount of mucus). It can reduce inflammation and prevent development of blood clots. The plant is indigenous to South America and is said to originate from the area between southern Brazil and Paraguay. Pineapple contains bromelain, a substance which decomposes proteins and facilitates digestion. People can use marinade made of pineapple juice to reduce toughness of the meat (bromelain acts as softener of meat). The natives of southern Brazil and Paraguay spread the pineapple throughout South America, and it eventually reached the Caribbean, Central America, and Mexico, where it was cultivated by the Mayas and the Aztecs. Pineapple can be easily cultivated using the crown of the fruit. Crown should be cut and partially dried before planting in the soil. Explorer Christopher Columbus in 1493 found pineapples on Guadeloupe Island in the Caribbean. He called it piña de Indes, meaning “pine of the Indians”, and brought it back with him to Spain. South Asia is the biggest producer of pineapples. More than 2 million tons of pineapples are produced and exported from Philippines each year. One plant produces only one pineapple per season. Ripening process ends after removal of the fruit from the stem. Almost all parts of the pineapple can be used in the production of vinegar and alcohol. Inedible parts can be used as food for domestic animals. Today, the majority of the world’s pineapples come from Southeast Asia. Pineapple can live and produce fruit for up to 50 years in the wild. In 2016, the top five producers of pineapples were: Costa Rica, Brazil, the Philippines, Thailand, and Indonesia. The pineapple is a herbaceous perennial, which grows to 1.0 to 1.5 m (3.3 to 4.9 ft) tall, although sometimes it can be taller. In appearance, the plant has a short, stocky stem with tough, waxy leaves. The plant takes almost three years to reach maturation. It can fruit a total of three times during its lifetime. Birds (such as hummingbirds) and bats pollinate pineapples. Pineapple plants have beautiful flowers which can vary from lavender, through light purple to red. When creating its fruit, it usually produces up to 200 flowers, although some large-fruited cultivars can exceed this. Two types of pineapples, called "cayenne pineapple" and "red Spanish pineapple" are currently cultivated and consumed throughout the world. They differ in color and size of the fruit. Once it flowers, the individual fruits of the flowers join together to create what is commonly referred to as a pineapple. So the pineapple fruit itself is actually a bunch of “fruitlets” fused together. The tough, waxy rind may be dark green, yellow, orange-yellow or reddish when the fruit is ripe. The flesh ranges from nearly white to yellow. In size the fruits are up to 30 cm (12 in) long and weigh 0.45 to 4.5 kilograms (1 to 10 pounds) or more. Christopher Columbus brought pineapple from South America to Europe. This fruit was first named "pina" because it looks like large pine cone. Englishmen later added name "apple" to denote it as a fruit. The top of a pineapple, after cleaning and drying, can be planted in soil and a new plant will grow. 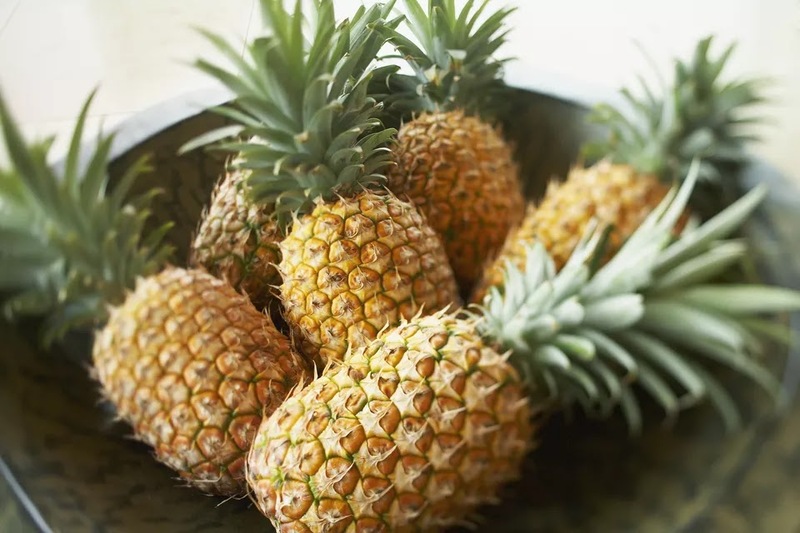 Pineapples have exceptional juiciness and a vibrant tropical flavor that balances the tastes of sweet and tart. Color of the fruit depends on the variety. Pineapples are usually red, purple or lavender in color. There are 50 calories in 100 grams (3.5 ounces) of a fresh pineapple. The pineapple is made up of mostly water (86%) and carbohydrates (13%), with almost no fat or protein. It has nutrients, vitamins, and minerals, including copper, potassium, calcium, magnesium, manganese, vitamin C, thiamin, B6, beta-carotene, and folate as well as soluble and insoluble fiber and bromelain. The health benefits of pineapple include their ability to improve respiratory health, cure coughs and colds, improve digestion, help you lose weight, strengthen bones, improve oral health, boost eye health, reduce inflammation, prevent cancer, improve heart health, fight off infections and parasites, improve the immune system and increase circulation. Fruit of pineapple is result of fusion of 100 to 200 individual flowers. The flesh and juice of the pineapple are used in cuisines around the world. In many tropical countries, pineapple is prepared and sold on roadsides as a snack. It is sold whole or in halves with a stick inserted. Chunks of pineapple are used in desserts such as fruit salad, as well as in some savory dishes, including pizza toppings, or as a grilled ring on a hamburger. Crushed pineapple is used in yogurt, jam, sweets, and ice cream. The juice of the pineapple is served as a beverage, and it is also the main ingredient in cocktails such as the piña colada and in the drink tepache. Pineapple is perennial herbaceous plant that has short and stocky stem. Its leaves are spiny and covered with wax on the surface. The word “pineapple” was first used in 1398 in reference to a pine cone. It is derived from the Spanish word “pina” which means pine cone. This was changed nearly 300 years later with the word “pine cone” being introduced so pineapple could be used exclusively for the fruit. You might also recognise the Spanish word “pina” from the name of the famous pineapple drink the pina colada. Pineapples are international symbols of welcome and are a symbolic way of saying “you are perfect” when presented to someone. Gate posts and door frames often have pineapples to signal a welcome. Pineapple can reach 3.3 to 4.9 feet in height. Large specimens of this fruit can reach nearly 20 pounds of weight. American colonists looked on pineapples as a luxurious treat because of their rarity and cost. Pineapples were such a status symbol in 18th century England that you could rent one for the evening to take to a party. The Guinness world record for the heaviest pineapple was set by a pineapple weighing 8.06 kg (17 lb 12 oz), grown by E. Kamuk of Ais Village, West New Britain Province, Papua New Guinea. A pineapple grown in Britain in horse manure is believed to be the world’s most expensive pineapple, allegedly worth £10,000 (US$12,800). The fruit was nurtured over two years using traditional and very expensive Victorian gardening techniques at the Lost Gardens of Heligan in Cornwall. Pineapple has protein bromelain that degrade meat. So if you put a piece of pineapple somewhere in your mouth it will start eating you.